The Atkins Diet and Hair Loss – Is There a Link? If you’re on the Atkins Diet and hair loss has become a problem, you should take stock of what you may be lacking nutritionally. While the Atkins diet menu plan strives to be balanced, you could make some mistakes while on the diet that can lead to hair loss because of nutritional deficiencies. The Atkins Diet is designed to severely restrict carbohydrates (which is why it is often called the “low carb diet). To replace them, more proteins and fats are consumed, which should come from a good balance of the many acceptable foods included in the plan. Lots of vegetables and fruits like berries are especially important. But you are also supposed to take a good multi-vitamin and mineral supplement and an Omega-3 supplement (often called Fish Oil capsules). 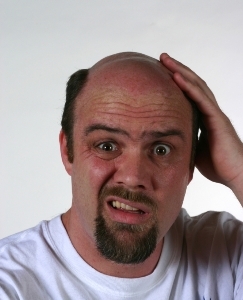 Hair loss is sometimes noticed when weight loss hits the 30-40 pound mark. This is probably because at this point you have been on the diet long enough that, if you haven’t been taking nutritional supplements, any missing nutrients have affected hair growth and caused some shedding. If you begin adding the supplements you should be taking while on the Atkins Diet, you should notice a real difference within three to four weeks. Dr. Atkins particularly stresses B-complex vitamins and vitamin E along with fish oil to maintain healthy hair and nails. Another possibility is the use of too much of some artificial sweeteners. Dr. Atkins recommended sucralose, which is found in the brand name Splenda. If you are using artificial sweeteners that contain aspartame instead, this could be the root of your problem. Too much aspartame can affect the scalp and hair follicles, so try switching to something else. If all else fails, you should talk to your doctor. The Atkins diet and hair loss may not be related in your case at all. Hair loss is sometimes a sign of hypothyroidism, which can be controlled with medicine. Another possible cause could be the beginnings of menopause. Either of these conditions can occur while you are on the diet and may be confused with a side effect of the Atkins diet. Read my article Atkins Diet Health Risks Examined to answer any other concerns you might have.